One of our fav dinners & alternatives to pasta! 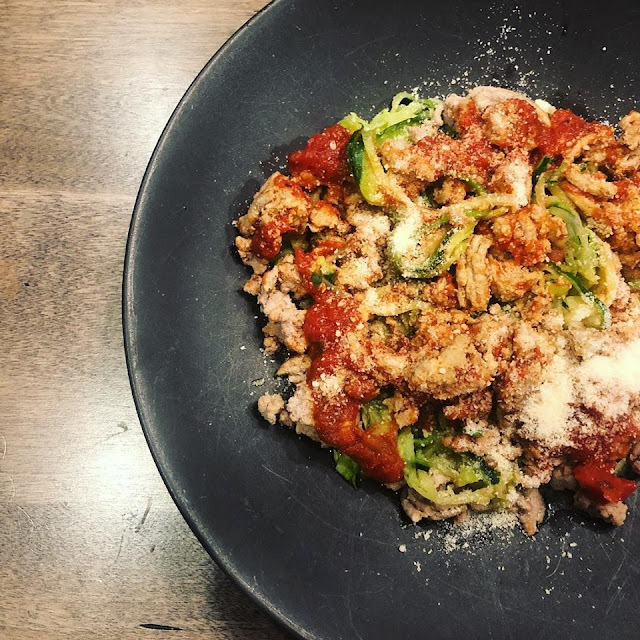 I love carbs (who doesn't) but I've been trying to avoid them at dinner time so lately we've been swapping the heavy pasta for zucchini noodles (aka #zoodles)! I learned when I did our new nutrition program a few months back that our dinner plates should be 75% veggies & 25% proteins so we've been making simple swaps like this and surprisingly it's also super easy to make! TIP: You will need a spiralizer. There are lots of spiralizers out there to make zoodles but THIS is the one we have. It's inexpensive and works great! 1. First wash the zucchini and cut off one end with a chef knife. 2. Then follow the instructions on your spiralizer to turn your zucchini into noodles. 3. Cook turkey meat in a pan and heat your sauce a separate saucepan. 4. In a large pot, heat olive oil in a large skillet on medium heat. 5. Add zucchini noodles and stir frequently. 6. Let cook for approximately 5-10 minutes, or until soft (do not overcook). 7. Once cooked, drain any excess water from the pot. 8. Add turkey meat and sauce, stir then serve. Top with parmesan & enjoy!